Oz the Great and Powerful begins with a wonderful black-and-white prologue. In 1905, a hack magician named Oscar Diggs (James Franco) performs a small-time circus act in between trying to shag the local women. He flirts with the wrong girl, however, and ends up running for his life. Diggs (also known by his stage name, Oz) escapes in a hot air balloon, only to get sucked into a nearby tornado. Somehow this tornado takes him to the Land of Oz, and it is here that the film pans out to full technicolor, bringing this magical new world to life. Oscar, confused but grateful to no longer be in danger, wanders around his new surroundings before meeting the witch, Theodora (Mila Kunis). She believes that Oscar is actually the wizard that has been prophesied to return and overthrow the Wicked Witch, and she brings him to meet her sister, fellow witch Evanora (Rachel Weisz). They send him to the Dark Forest to destroy the Wicked Witch’s wand, but he discovers that this witch is not so wicked after all — she’s actually Glinda the Good Witch (Michelle Williams). Now Oscar finds himself caught in the middle of a battle between the two sides, all while being forced to masquerade as the powerful Wizard of Oz. As a film, Oz the Great and Powerful is likely exactly as you might expect it to be. It works well as a kid’s film — Oscar meets some crowd-pleasing fantasy characters on his way, including a china doll and a flying monkey — though its 2+ hour running time might be a burden for some little ones. The Land of Oz is colorful and vibrant, and the Munchkin inhabitants of Emerald City are sure to be a hit (despite having a very small role). In this regard, the film succeeds. However, it’s hard not to expect more in the hands of director Sam Raimi. The characters are hardly interesting. James Franco makes Oz come across as a total sleazeball, and it’s hard to buy in to the fact that he has any ‘good’ values underneath. Michelle Williams and Rachel Weisz do well with their material, but Mila Kunis is completely out of her element as Theodora. Kunis isn’t given much to work with, but her performance is devoid of any real emotion. I also noticed some issues with the CGI — there were multiple occasions where the actors’ interactions with the artificial characters were completely off (i.e. Franco trying to shake the china girl’s hand but there being a noticable gap in between). For a film with a budget north of $200 million, these quirks are inexcusable. 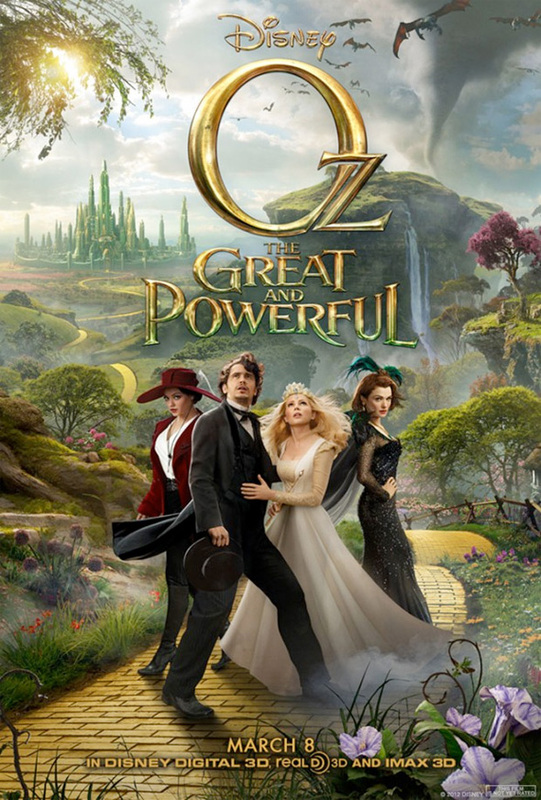 And so goes Oz the Great and Powerful, a superficially pretty film without any real depth. Judging from my audience’s reaction, the kids seem to be digging it, so the film has that going for it. It’s just a shame that it isn’t as magical as it could have been. Not really planning on seeing this one. It sounds like I won’t be missing too much though. It just looks a little too much like Tim Burton’s Alice in Wonderland. Yeah, it does share some similarities to Burton’s Alice. I think I prefer Oz more, but not by much. Nice review Eric, I think I’ll be saving this one for a rental. Yeah, a rental is probably the way to go here. Thanks for the Twitter shoutout, BTW! I was looking forward to this one but after reading mostly lukewarm reviews I decided to wait until it’s a rental. Looks I made the right choice. Nice review. Thanks man, yeah this is a decent rental but that’s about it. Glad I caught a cheap matinee showing. I cannot wait to see this film. I also want to see Pacific Rim when that comes out, that looks killer! Oh yeah, Pacific Rim looks pretty nuts. Definitely one to see in the theater. Oz is decent enough, just make sure to go into it with lowered expectations. Ugh, I hated this movie. Sam Raimi’s worst movie by far. Most people seem to agree with you, that’s it’s just OK, so maybe I’m just out of touch. I did like the big finale. Nah, I don’t think you’re out of touch at all. There are some really grating aspects of this film — it’s just a matter of how much you let them get to you. It’s disappointing to think this came from Sam Raimi, but then again, I should have expected as much since the marketing was pretty spot-on for what this ended up being. When Raimi seems to be having fun, everybody else does as well. I’ll admit, it wasn’t perfect but it sure as hell didn’t make me miserable and contemplate what to do next with my life. Good review bud. Hah, thanks man. Sounds like we are somewhat on the same wave length then. I haven’t got around to seeing this, but it sounds quite good. Great review! Thanks, Paul! As long as you aren’t expecting anything revolutionary, you should enjoy this. I enjoyed it. I was more on board with your “In this regard, the film succeeds.” paragraph, and less bothered by the things you brought up afterwards. Fun move. I didnt really expect much more than that! Yeah, I’m kind of curious how this played out in 3D. I bet the opening title sequence looked really cool. Great review Eric, even though I enjoyed this more than you, I do recognize the flaws you pointed out, esp. about the characters. Agreed that Franco played Oz as a total sleazeball! That said, I must’ve been in a good mood when I saw this that I was very entertained. Visually I was mesmerized so perhaps I was so entranced that I didn’t notice the flaws. Cheers Ruth, yeah this was a visually appealing film for sure. Sometimes the CGI was too distracting, but I did enjoy the vibrant colors. Glad you got more out of it than me! I love Michelle Williams, too, but she isn’t given much to work with here. Not sure if it’s worth seeking out just for her, unfortunately. too bad…hopefully she chooses wisely next time. But I’m sure starring in an Oz film directed by Raimi would have seemed like a good idea. Yeah, and I think I remember reading that she accepted this role for her daughter. I can’t fault her for that. I was planning on seeing this on Wednesday, but I’ve decided to watch Trance instead haha. Your review picks up most of the criticisms I have read around the web about this film. I’m doubtful I will give it a shot in the theater, but I will certainly wait for it when it comes out on DVD/Blu-Ray. Sure, I will miss some of the effect of the big screen, but in a film that has been labeled as superficial and patchy, I can’t say I will find myself regretting it. Yeah, you’re not missing much, Niels. I bet the 3D is nice, but I’m sure the colors will pop just fine on Blu-ray. I was dragged into seeing this and I disliked it even more than I expected. Thought the acting was terrible by almost everyone and some of the CG was just bad. Only scene I thought was interesting was the connection towards the end of Oz and his appearance in the original. Ouch, I went into this not expecting much so I wasn’t too disappointed. Glad I’m not alone in finding issues with the CG — it was rather glaring at times, I thought.